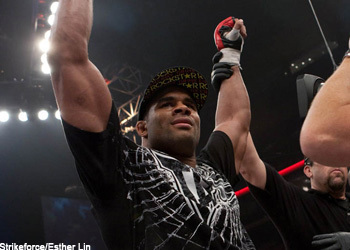 If he wasn’t used to the questions before, Strikeforce heavyweight champ Alistair Overeem better become accustomed to them now, because there will be plenty more coming. After easily disposing of Brett Rogers on Saturday night at “Strikeforce: Heavy Artillery,” if, when, where and why not inquiries regarding a mega-fight with Fedor Emelianenko will surround the controversial title holder until the scrap comes to fruition. Although they have previously competed together in Japan under the famed PrideFC banner, and are both currently employed by Strikeforce, their accomplished paths have failed to cross. Despite the Dutchman’s continuous efforts to locate MMA’s most wanted heavyweight, he’s confident things will finally get done this time around. Why do you think they would conjure up a tale of you juicing when you have never produced a positive drug test??? “They are ducking me. They are putting all sorts of barriers to not have the fight happen. I think they are the obstacle,” Overeem added. “Fedor is not the obstacle, I’m not the obstacle.